Solar thermal energy (STE) is a technology for harnessing solar energy for thermal energy (heat). Solar thermal collectors are defined by the USA Energy Information Administration as low-, medium-, or high-temperature collectors. Low temperature collectors are flat plates generally used to heat swimming pools. Medium-temperature collectors are also usually flat plates but are used for creating hot water for residential and commercial use. High temperature collectors concentrate sunlight using mirrors or lenses and are generally used for electric power production. 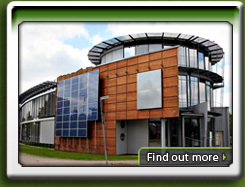 STE is different from photovoltaics, which convert solar energy directly into electricity. While only 600 megawatts of solar thermal power is up and running worldwide in October 2009 according to Dr David Mills of Ausra, another 400 megawatts is under construction and there are 14,000 megawatts of the more serious concentrating solar thermal (CST) projects being developed. In the United States, heating, ventilation, and air conditioning (HVAC) systems account for over 25 percent (4.75 EJ) of the energy used in commercial buildings and nearly half (10.1 EJ) of the energy used in residential buildings. Solar heating, cooling, and ventilation technologies can be used to offset a portion of this energy. 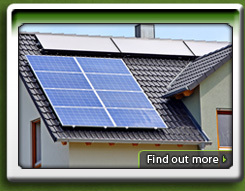 Thermal mass materials store solar energy during the day and release this energy during cooler periods. Common thermal mass materials include stone, concrete, and water. The proportion and placement of thermal mass should consider several factors such as climate, daylighting, and shading conditions. When properly incorporated, thermal mass can passively maintain comfortable temperatures while reducing energy consumption. Heat in a solar thermal system is guided by five basic principles: heat gain; heat transfer; heat storage; heat transport; and heat insulation. Here, heat is the measure of the amount of thermal energy an object contains and is determined by the temperature, mass and specific heat of the object. Heat gain is the heat accumulated from the sun in the system. Solar thermal heat is trapped using the greenhouse effect; the greenhouse effect in this case is the ability of a reflective surface to transmit short wave radiation and reflect long wave radiation. Heat and infrared radiation (IR) are produced when short wave radiation light hits the absorber plate, which is then trapped inside the collector. Fluid, usually water, in the absorber tubes collect the trapped heat and transfer it to a heat storage vault. Heat is transferred either by conduction or convection. When water is heated, kinetic energy is transferred by conduction to water molecules throughout the medium. These molecules spread their thermal energy by conduction and occupy more space than the cold slow moving molecules above them. The distribution of energy from the rising hot water to the sinking cold water contributes to the convection process. Heat is transferred from the absorber plates of the collector in the fluid by conduction. The collector fluid is circulated through the carrier pies to the heat transfer vault. Inside the vault, heat is transferred throughout the medium through convection. Heat storage enables solar thermal plants to produce electricity during hours without sunlight. Heat is transferred to a thermal storage medium in an insulated reservoir during hours with sunlight, and is withdrawn for power generation during hours lacking sunlight. Thermal storage mediums will be discussed in a heat storage section. Rate of heat transfer is related to the conductive and convection medium as well as the temperature differences. Bodies with large temperature differences transfer heat faster than bodies with lower temperature differences.